The CBD & Hemp industry is growing at a record rate– with more educating being done by major brands and more knowledge being attained by the general market, success can be found in the CBD industry. How can you go from having a CBD/Hemp product idea to becoming an established brand during the hype? 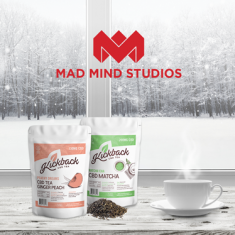 Mad Mind Studios is a design & marketing agency based in Los Angeles, one of the founding hubs of CBD product manufacturing and consumption in the world. Our experience ranges from retail products to CBD manufacturing & distribution. This new marketplace requires tactful measures from the beginning in order to find success. Kickback Cold Brew is a CBD-infused coffee & tea company that sells both online and in organic/fresh grocery stores throughout the country. Founded in Los Angeles, we gave them a brand that evokes thoughts of the chill culture in Southern California that Kickback can provide. Everything that you see for Kickback online & in-stores was made right in our office in West Los Angeles. Working with us is simple, but it’s a team effort. Our process is illuminated by our desire to know more about your CBD/Hemp product or service before we put our pens to the paper. Your CBD logo design can be entrusted with professionals. We want to know about your product/service, your mission, your goals, and why you think the market needs your business. What hole in the market are you targeting and why would people buy from you? The Discovery Phase is imperative for us to do our job the best– with multiple meetings and phone calls under our belt, we can work together to align our creativity with your vision. Illustration is not just design, it’s also in writing. We need to illustrate our discovery phase into a cohesive brand strategy that will influence the design and marketing for the next 5-10 years at least. We will help you through this process so you can be confident in the longevity & success of your branding. We will then design your brand with multiple reviews from you and your team. Your honest and complete feedback will result in a better product for your business. It’s optional, but we can provide you with a Brand Style Guide that can help guide you forever on how to accurately pitch and represent your brand at events, online, in-stores, and around the world. Once the branding is complete, we can help you bring the product/service to market with a new website, a pitch deck, and digital marketing strategies. Since we have identified your target market, we can use this information to reach out to them to the best of our abilities. We will set Key Performance Indicators and help you establish goals for the next 6 months to 5 years, depending on your needs. Are you ready to launch your CBD or Hemp company? If you’ve read this far, then you should give us a call for a free consultation and we can let you know the best way to bring your product or service to people who want/need it. Contact Mad Mind Studios at info@madmindstudios.com today!